Although 2014 saw the release of two Assassin’s Creed games, Assassin’s Creed Unity and Rogue, many fans of the series were left slightly disappointed. Although Unity wasn’t a bad game by any means, it shipped with a plethora of bugs and glitches that got in the way of player’s enjoyment. And Assassin’s Creed Rogue, while a decent entry in this long-running series, failed to generate much excitement, perhaps due to the fact that it was only released for last-gen systems (and it will also be the last Assassin’s Creed game to hit the old Xbox 360 and PS3 consoles). So it makes sense that expectations are sky-high for Assassin’s Creed Syndicate, which will be set in Victorian London and will be released on October 23 on new-gen systems. And it looks like Ubisoft’s latest game could feature quite a few improvements gameplay-wise… Here follows a list of 5 gameplay surprises to be found in the upcoming Assassin’s Creed Syndicate. Those who played previous Assassin’s Creed games know that, while the game’s historical fiction is great as it takes you to another time and place (like the Revolutionary Paris of Assassin’s Creed Unity), the present-day gameplay of earlier games like Assassin’s Creed Brotherhood was also pretty good, as it gave context to the bitter struggle between the Assassins and the Templars. And seeing present-day protagonist Desmond and his pals in Assassin’s Creed Brotherhood go about their business in the modern-day town of Monteriggioni in Italy (a location that was smartly reused from Assassin’s Creed II and which players had previously visited in the Renaissance in that game) was something of a masterstroke. 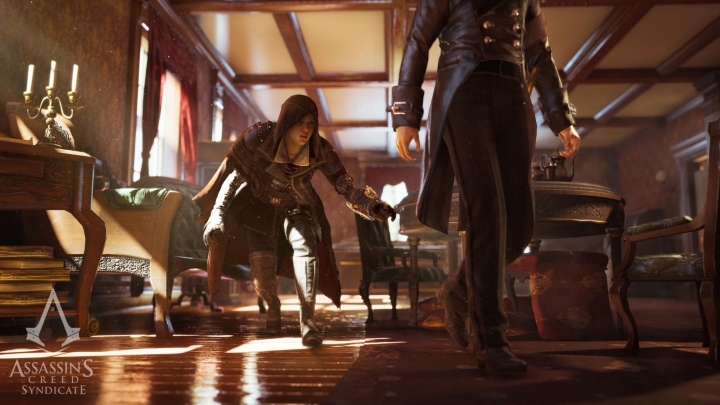 And although Unity also had a twist on the modern-day gameplay (the rifts that allowed protagonist Arno to travel forward in time, like in the World War 2 scenario), fans of the series probably still yearn for modern-day gameplay like in the earlier Assassin’s Creed games, and Ubisoft will likely answer their wishes as they have vowed to continue the present day story in the upcoming Assassin’s Creed Syndicate.